The BeanBag Deluxe is luxurious, comfortable, and convenient! The veneered hardwood platform has an attractive mahogany finish and the front edge of the platform is concave, which provides a natural 'fit' when used in a person's lap. 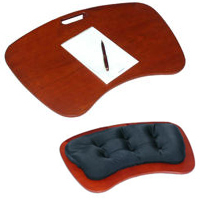 This contoured portable desk for your lap lets you work or play from the comfort of your favorite chair, sofa, or bed. Expertly crafted, this unique product features a soft, silky, pleated & buttoned beanbag pillow bottom filled with polystyrene micro-beads. The platform includes a convenient carrying handle and the pillow is easily removed if desired (as it is simply attached with velcro). Carrying handle: Allows you to easily carry the BeanBag Deluxe Laptop Table wherever you need it.